Calechosa Bay is a small, planned, sustainable community overlooking the ocean, six kilometers north of Melaque, Jalisco, Mexico. Facing south in a beautiful and secluded bay, it rises up from a rocky beach to a height of 70 meters, providing magnificent ocean views from all lots. Between the southern boundary of Calechosa and the ocean there is only a one-lane road and the Federal Zone (a strip of twenty meters from high tide). Phase One will offer six building lots of between seven and eleven thousand square feet. In Phase Two, about ten more lots will be offered. Phase Three will offer twelve condominiums on two remaining lots. There will be twenty-six lots in all, some of which are reserved for partners in the development. Access to Calechosa Bay will be through a single gatehouse with a resident gatekeeper. Each buyer will be free to design and build their own home, or they can use the services of the developer. However, there will be architectural guidelines to ensure a harmonious and functional environment. The overall style will be west coast Mexican modern. Guidelines will ensure the preservation of views and the quality and neighborliness of each house. There will be a beautiful shared terrace and pool for house owners, with panoramic views. Individual pools will also be permitted. Melaque is a beachfront town about three and a half hours south of Puerto Vallarta by car, and an hour north of Manzanillo. From Calechosa, basic grocery shopping is available at the village of El Ranchito on the main Vallarta – Manzanillo highway, ten minutes by car from Calechosa. Five minutes further, Melaque has all kinds of shops, restaurants and a Banamex branch with ATM. It is a rapidly developing, friendly Mexican town, where prices for tourists are still about half of those in Vallarta. Calechosa is a well-known surfing area, but only strong swimmers should go out (hence our communal lap pool). There is a sandy beach a few minutes’ walk away, and others at Melaque and nearby Cuastecomate, with beachside restaurants. 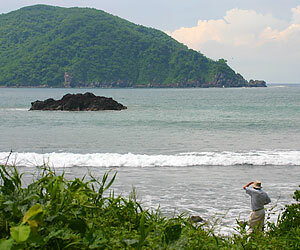 Tenacatita, forty minutes away, has superb swimming and snorkeling. Fishing charters go out of Barra de Navidad, twenty minutes from Calechosa. There is a championship golf course at Barra, with guaranteed access for buyers at Calechosa.